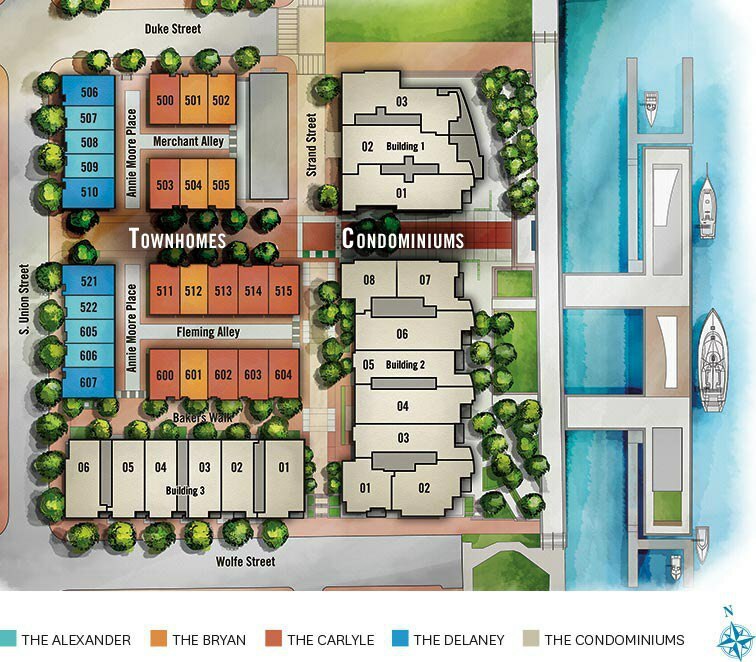 Inspired by the Old Town waterfront, the residences at Robinson Landing have been thoughtfully designed to provide unprecedented river views. Condominiums feature open living spaces and floor-to-ceiling windows that frame matchless panoramas of D.C. and the Potomac River. New townhomes face Old Town’s historic streets, designed with attention to details that transition traditional to modern architecture, and private elevators that rise to expansive rooftop terraces. Residents will enjoy thoughtful luxuries such as concierge service, state-of-the-art fitness center, private underground parking, pet grooming station, bicycle shop, and private lounge. For a list of amenities, click here. Spacious, single-level residences present striking views of the Potomac, while the lively atmosphere of the Old Town waterfront is available for you at the touch of an elevator button. Steps from the promenade and the best of Old Town, classically inspired facades open into spacious, modern floorplans, with personal elevators, private rooftop terraces, and a long list of well-appointed features.